« Have you had a self-driving car encounter? What’s the best way to Santa Cruz? Ride begins on Los Gatos Creek Trail. There’s a steep section right before climb up the Lexington Reservoir dam. 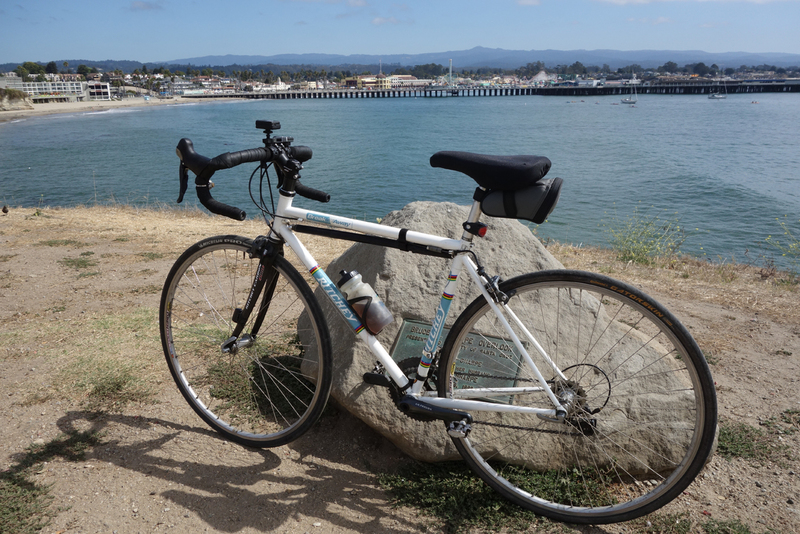 A long time ago I posted the best route to Santa Cruz from Los Gatos. It deserves a more thorough review. I wouldn’t say any one route is the best. They all have good and bad points. Following are some routes for your consideration. I’ve ridden all of them multiple times and with many variations. That’s easy, but the route, while legal, is NEVER recommended. Not even Christmas day. That’s because it takes Hwy 17 for a half mile and involves a left-hand turn. Los Gatos Main Street; Los Gatos Creek Trail; Alma Bridge Road; Aldercroft Heights Road; Old Santa Cruz Hwy; Hwy 17, Glenwood Drive; Granite Creek Road Overpass; S. Navarra Road/Green Hills Road; Glen Canyon Road; Branciforte Drive; Market Street; Water Street; San Lorenzo River path. There’s a plan to build a wildlife underpass near that half-mile stretch of Hwy 17. Wish they’d make it accessible for people. When I was riding to Santa Cruz I liked this route the most, although I often rode a 105-mile Hwy 1 loop, which was my real favorite. Los Gatos Main Street; Los Gatos Creek Trail; Alma Bridge Road; Aldercroft Heights Road; Old Santa Cruz Hwy; Mountain Charlie Road; Glenwood Drive; Scotts Valley Drive; Mount Herman Road; Hwy 17 flyover to El Rancho Drive; Plymouth Street; Emeline Street; Fernside Street; Plymouth Street; Felker Street; San Lorenzo River path. The problem with this route is the flyover. It’s not an easy maneuver. Drivers will wonder what you’re up to. It’s a better return route because the flyover isn’t a problem going that direction. There are two alternatives. First, take Glen Canyon Road off Mount Herman Road, then Branciforte. I’m not crazy about Glen Canyon Road because some drivers like to speed here, and it’s a two-lane road. 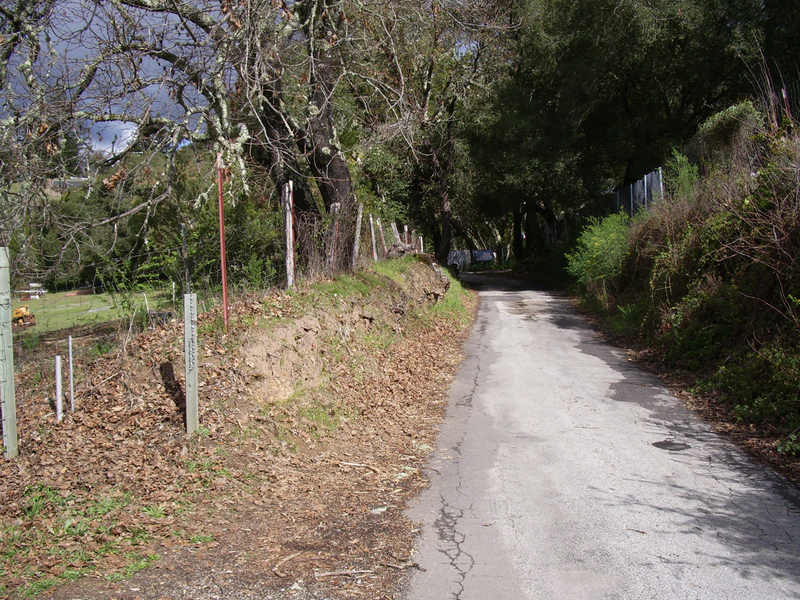 Second, take La Madrona Drive, which parallels Hwy 17 until an underpass back to El Rancho. Unfortunately, La Madrona has a lot of traffic, it’s narrow and people speed. 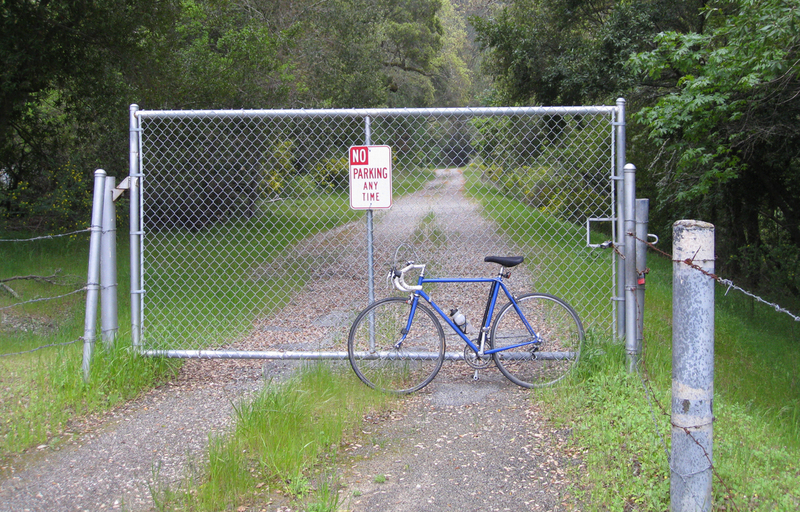 There’s another route from Scotts Valley that I haven’t taken — Lockewood Lane to Graham Hill Road, which goes to Santa Cruz. I haven’t done it because I’ve ridden Graham Hill enough times to know there’s no pleasure in it. Traffic is heavy and moving fast on Graham Hill, which is narrow in places. South Pacific Coast Railroad right of way at Aldercroft Heights Road. Another alternative in Scotts Valley is to take Granite Creek Road (Hwy 17 overpass is easy) to Branciforte. It’s a nice descent and not much traffic. This route calls for branching off onto Mountain Charlie Road off Old Santa Cruz Highway and climbing to the Hwy 17 overpass at Summit Road. It’s a steep climb on Mountain Charlie. Descend Mountain Charlie Road. Keep your speed down because there’s an occasional car going up and the road is narrow. The stagecoach used Mountain Charlie Road. Must have been quite a ride. Take Glenwood Drive or Bean Hollow Road into Scotts Valley. Bean Hollow Road doesn’t have many cars, it’s scenic, and not too steep except the last quarter mile when going north. Returning via Mountain Charlie Road is the best way home for avoiding cars. It’s real steep in several places, but they’re short stretches. This is a great way to go (but not from Santa Cruz) if you like long, fast descents. However, it means riding on Summit Road in traffic. You’re not going to Soquel, so take Laurel Glen Road/Mountain View Road, Branciforte. There’s a climb on Laurel Glen, but much less traffic compared to Soquel, then Soquel Avenue. Hate speech on San Jose-Soquel Road. I don’t recommend riding up San Jose-Soquel Road because there’s a lot of traffic. There’s much less traffic on San Jose-Soquel going south in the morning. Bear Creek Road. It’s better to ride down than up. The road is steep and has a lot of traffic. You can take the lane on the descent and keep with traffic, except for the occasional speeder. Redwood Estates. I’ve never been up that direction, and only down a few times. It’s a very twisty route with lots of driveways. I’m not a fan. It used to be an option when returning from Santa Cruz, but Hwy 17, even though it’s only 0.36 miles to Laurel Road, is a nightmare today. Turning left is extremely dangerous. This should be the go-to route into Santa Cruz from the Bay Area, but the ride from Boulder Creek into Santa Cruz has some narrow sections and traffic is heavy, always. It’s too bad because this is the most scenic canyon in the Santa Cruz Mountains with the San Lorenzo River. I’d like to see the Roaring Camp Railroad right of way turned into a recreation path, should they ever close up shop. Not that I’m for that. I love the railroad. I’ve never ridden to Santa Cruz on a weekday, and I’m not about to. Many drivers commute from Santa Cruz to the South Bay and you can be sure they don’t all take Hwy 17. They’re in a hurry. Ride early on a Sunday morning and it’s not too bad. 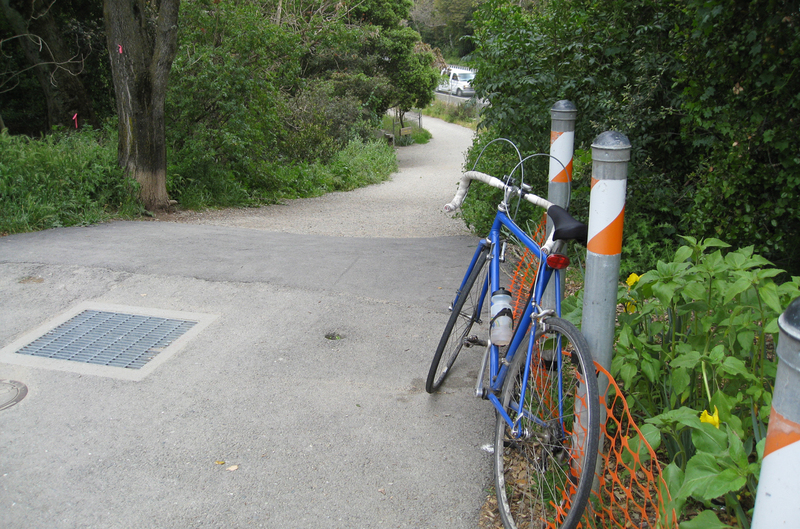 Keep to the San Lorenzo River path to avoid traffic during beach weather. Why we ride to Santa Cruz. The beach. This entry was posted on January 18, 2019 at 5:25 pm and is filed under Ride reports. You can follow any responses to this entry through the RSS 2.0 feed. You can leave a response, or trackback from your own site. IMO, easiest/most relaxed (ie, least traffic) route to Santa Cruz is through Los Gatos around reservoir, then Old Santa Cruz highway to Mt. Charlie to Summit then Mt. Charlie to Glenwood to Scotts Valley. (Mountain Charlie descent is a little rough). Once in Scotts Valley you have lots of options, but Granite Creek is relaxed and it’s recently repaved so it’s a nice smooth descent to Branciforte to Santa Cruz. Fastest is probably 9 through Saratoga, Boulder Creek, and Felton. 9 seems friendly to cyclists until after Felton. After Felton the drivers don’t seem to like cyclists. 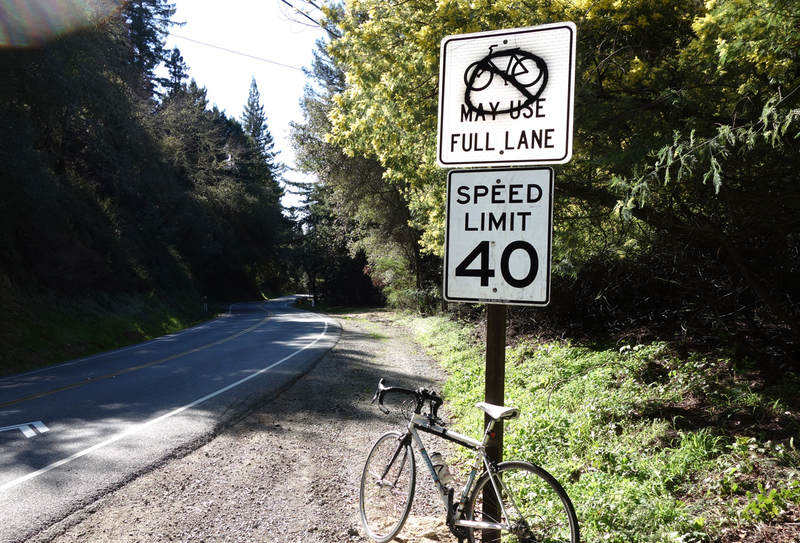 They’ve done a nice job signing on San Jose-Soquel Rd, but I get the feeling drivers on this road don’t like cyclists either (being recently sideswiped by a local in a pickup truck). It’s too bad there isn’t a connector from Laurel to Glenwood cutoff under 17, that would be the best route. Thanks, very helpful. I’ve always wanted to ride that way, but I’m not familiar with these backroads. From Scotts Valley to Santa Cruz, you mention (but don’t advise) the “Hwy 17 flyover” to El Rancho Drive. I never even thought of this as a possibility, and had to look at the map to see what you mean. PS – Along with jamesRides, I also prefer going around the reservoir to the west. It’s a dirt path — maybe not for a road bike — and it gets muddy after a rain, but there is significantly less up-and-down than Alma Bridge Road. And it’s about a mile shorter to the point where Aldercroft joins the Old Santa Cruz Hwy. It works even better heading downhill, because you don’t have to take the dirt path. Just stay on Old Santa Cruz. After Bear Creek Rd, take the on-ramp towards Hwy 17. It may look a bit intimidating, since it appears that you’re going right onto the highway, but in fact you are can stay on the long on-ramp to the right of the through traffic until you reach the turn-off at Alma Bridge Rd. My method of negotiating the left on to El Rancho from the Mt. Herman Rd. flyover is to turn right onto La Madrona Dr, U-turn, and press the Walk button requesting to cross Mt. Herman Rd. Once the light changes and stops the traffic on the flyover and the on-ramp to HW17S, turn right and keep pedaling. You arrive at the left turn before the traffic catches back up with you. I forgot to mention La Madrona Drive in Scotts Valley, which parallels Hwy 17 until an underpass. However, this road has a lot of traffic, it’s narrow, and drivers like to speed. El Rancho has way less traffic, so it’s worth negotiating the 17 flyover. As for riding around Lexington Reservoir on the west side dirt path, it’s gnarly during the winter. It’s part of my “Lexington Reservoir” ride in the 4th edition of Bay Area Bike Rides. Easier to do when riding north.